When you finish working on your project and you want to print it on paper, you can do it by opening the Backstage View in FILE >> Print or using the Ctrl + P keyboard shortcut. In the upper left corner, you will find the Print button. When you press it, the document will start printing. Next to this button, you can set how many copies of the document should be printed. Here, you can choose the printer you want to use. It can be a standard printer, fax, Microsoft XPS Document Writer, or other, depending on the software installed on the computer. In settings, you have access to the range of options from the drop-down menu. 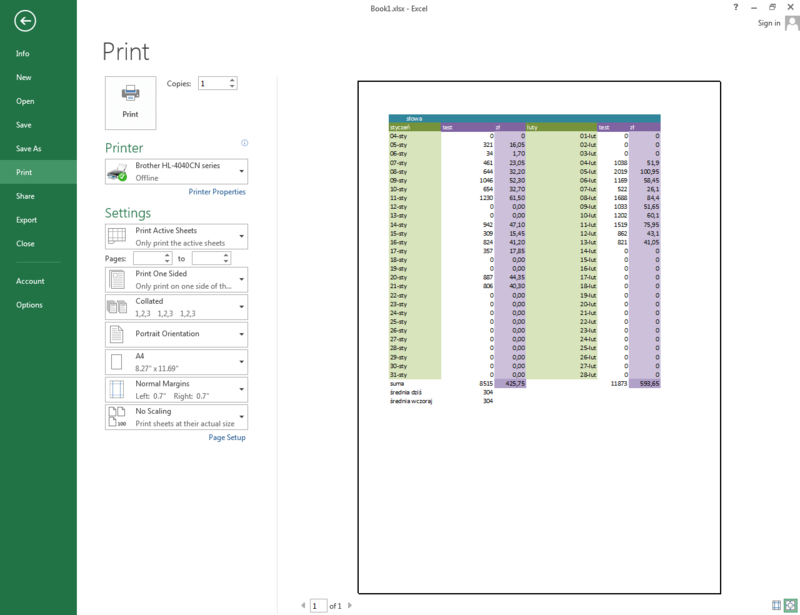 You can select which part of the workbook you want to print. By default, it is set to Print Active Sheets. You can change it to Print Entire Workbook or Print Selection. In addition, you can set whether to sort the pages, choose portrait or landscape orientation, set margins and set the size of the print paper. On the right side of the window, you will find the print preview. If you print more sheets or the sheet doesn’t fit on a page, you can choose which pages should be printed.